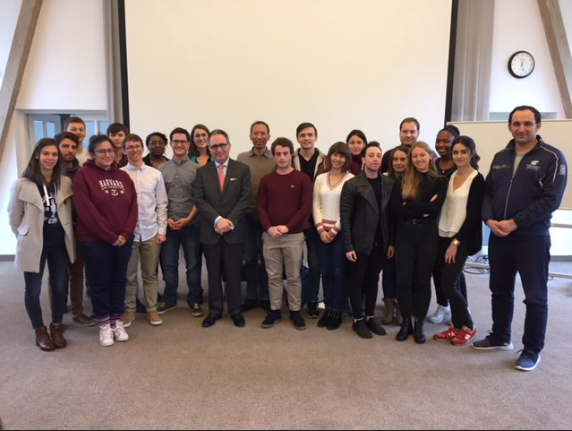 On Saturday, 27 October 2018, Natolin students had a great opportunity to participate in a workshop on "Modern Diplomacy in Practice" with H.E. Ambassador of Belgium Raoul DELCORDE. "H.E. Ambassador Raoul DELCORDE is one of those diplomats for whom the expertise on diplomacy cannot be questioned. Author of many books on the subject and with his extensive work experience, he helped the students to fill the gap between theory and practice. Going from general concepts related to diplomacy, he provided insight, allowing the audience to seize all the nuance, the challenges and the opportunities of this profession." — Benjamin ROBINET, our Belgian student recalls the workshop by Ambassador DELCORDE.